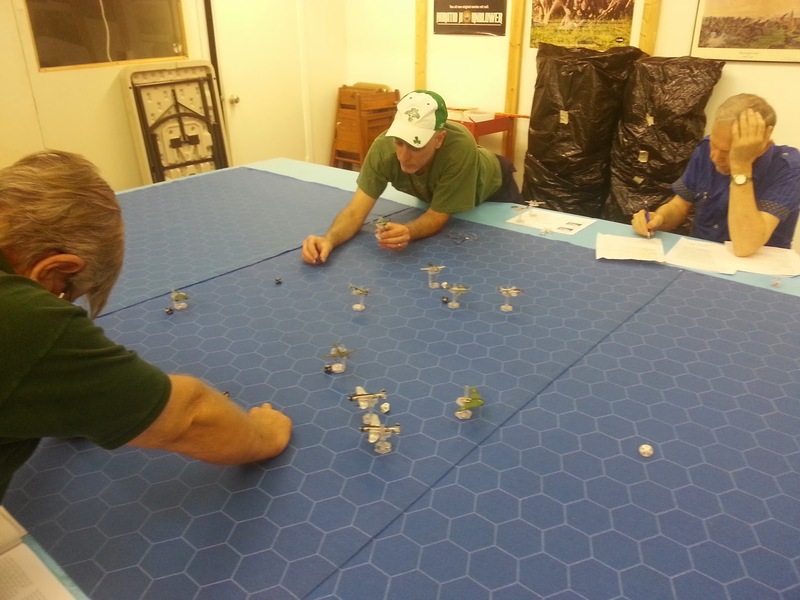 Here is the March SMG game, 21 March 2015, at "Das Krieg Haus" In Fort Lauderdale, Fl. Bob Walton: Thanks to Jeff, Cpt. Ron and Bill Pritchard for showing up today, with a guest appearance by Bill Moreno to say good-bye, pick up some terrain and share the book Jeff produced, "Bill's Garage". Everyone should take a look at that book, it 's very well done. Bill will be sorely missed but said he would return from time to time on business and might even show up for a game. 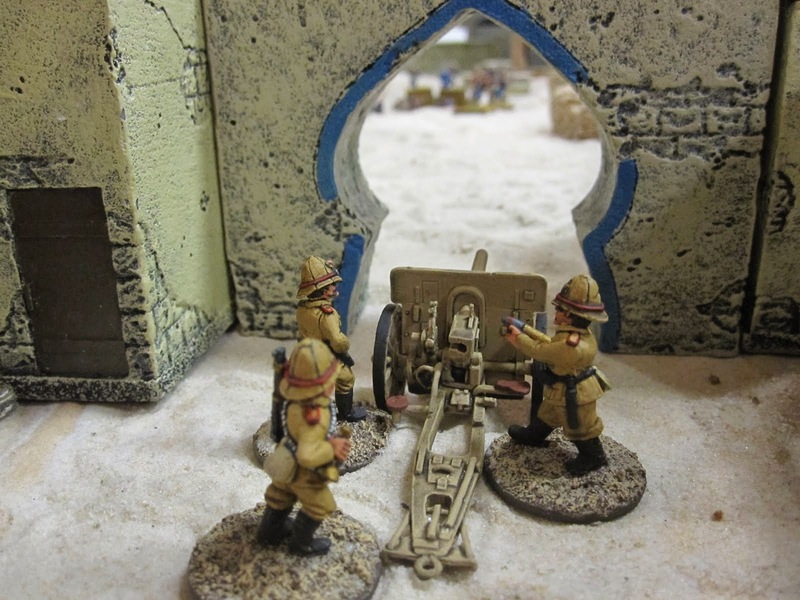 Jeff Baumal: Awesome after action game report Bob! Thank you for taking the time to come up with such a cool scenario and back story, for your patience in explaining the rules, and for our in flight combat maneuver options. Happy Birthday Brother!!!! A deep cover OSS agent working in a secret Luftwaffe research base is assigned to retrieve intelligence on the progress of the German "Wunderwaffen" jet program. He learns that two advanced jet aircraft prototypes are actually flyable, and have been ordered flown back to another secret base near Salzburg [within easy reach of Berchtesgaden and inspection by the Fuhrer). Our intrepid agent learns of the launch date and time, and gets word to Allied Command but while transmitting is nearly captured by local Gestapo. Now under much closer scrutiny, our agent begins to look for a means of escape, as his mission has become too perilous. He sees the pilots, helmets on and goggles lowered heading to the hangar for a pre-flight briefing and gets an idea... He returns to his quarters, sends out one last radio message to his handler, destroys the machine, and moves quickly towards the hangar. Two German advanced jet prototypes, a Horton 229 and a Focke-Wolfe Ta-283, are escorted by two Me-262s, supported by two FW190Ds. Radio silence has been maintained when they see a flash of silver, and the direct approach of P47Ds and P51Ds on an intercept course! "Mein Gott! ", exclaims Hauptmann Baumal, "how did zey know?" Maneuvering his formations of Me262s and FW190Ds to intercept the Americans, Hauptmann Baumal accelerates the precious prototypes away from the imminent threat to make a run for their Alpine sanctuary. He watches the Americans approach and notices they are closing but seem to be holding back a bit, not consistent with their typically aggressive tactics. Just as they enter engagement range, a burst of radio traffic from his own formation exposes that our clever OSS agent must have incapacitated one of the pilots, and has taken over the Ho229! 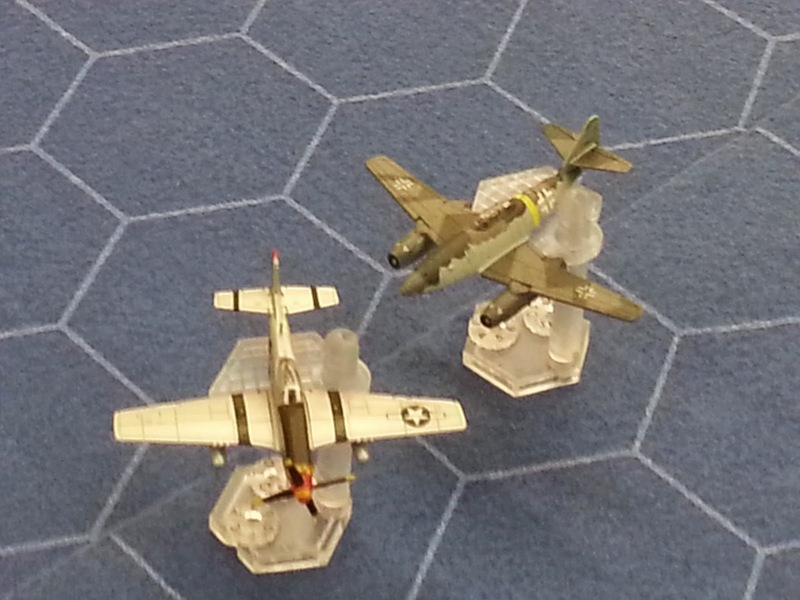 It dives away toward the Americans, who now close with the remaining Germans, intent to knock down the FW Ta-283 and protect the defecting Ho229 as it races towards safety behind the P51Ds and P47Ds. After all, our OSS agent is hardly an experienced pilot, so he'll be a sitting duck if attacked...and even if he wasn't, the Ho229 is barely a flying prototype - it currently has no guns! Disconcerted by this unexpected (and unwelcome!) 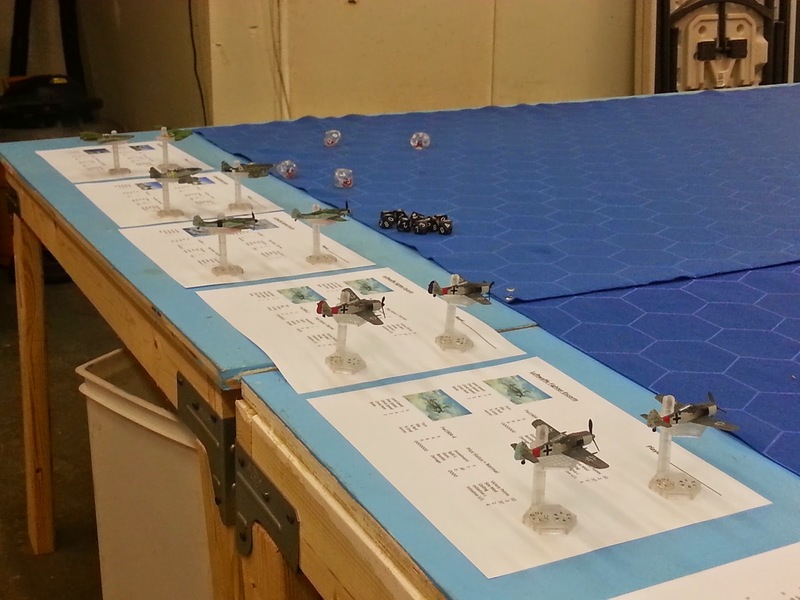 turn of events, Haputmann Baumal reorients the Ta-283 to traverse behind the wall of German fighters and closes his Me262s and FW190Ds with the Americans to teach the Amis a lesson. With altitudes diverging and angles off, it's tough to get lined up for a clear shot! Settling for a deflection shot at less than ideal range and altitude differential, one of the Me262s opens up with a fusillade of cannon fire on the nearest P47D, but is unable to score a hit. At the same time, Captain Ron, flying P47Ds, recognizes the close call and maneuvers to try to get lined up on the Germans. A proper hairball results, with planes going in all directions. 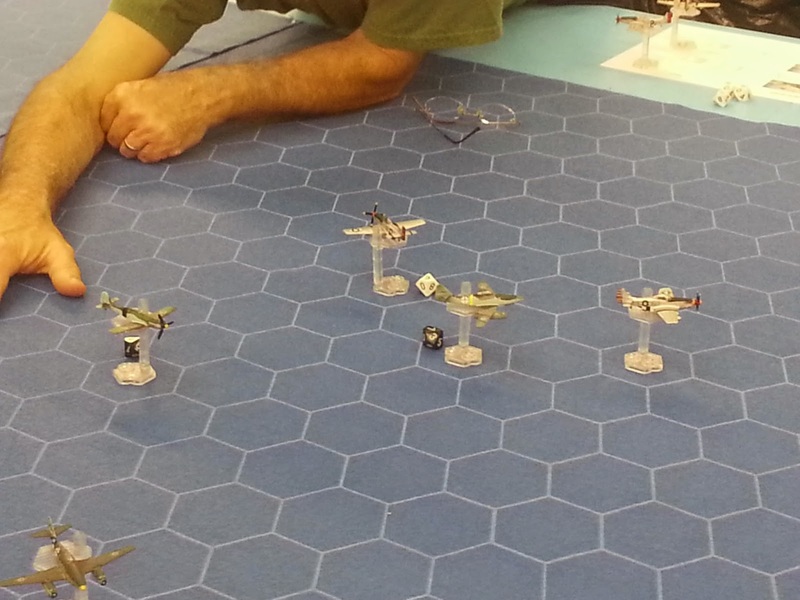 Meanwhile, Lt. Pritchard, flying P51Ds, is trying to gauge the approach of the German planes, and struggles to line up for a solid shot, frustrated by the angles and the speed of the oncoming German Ta-283. Realizing if the jet gets by he won't be able to catch it, he plots and replots his potential moves, carefully trying to achieve advantage to get off at least one shot in hopes of doing enough damage, or scoring a critical, to down the valuable prototype. While the hairball continues to unravel, our OSS agent, now being guided by Captain Ron toward his exit target, is being chased by a pursuing Me262 of Hauptmann Baumal, diving on him from higher altitude. Despite his best attempts to close the range and the altitude differential for a telling shot, Hauptmann Baumal soon realizes his chase is futile and breaks off pursuit to reengage with the other American planes. 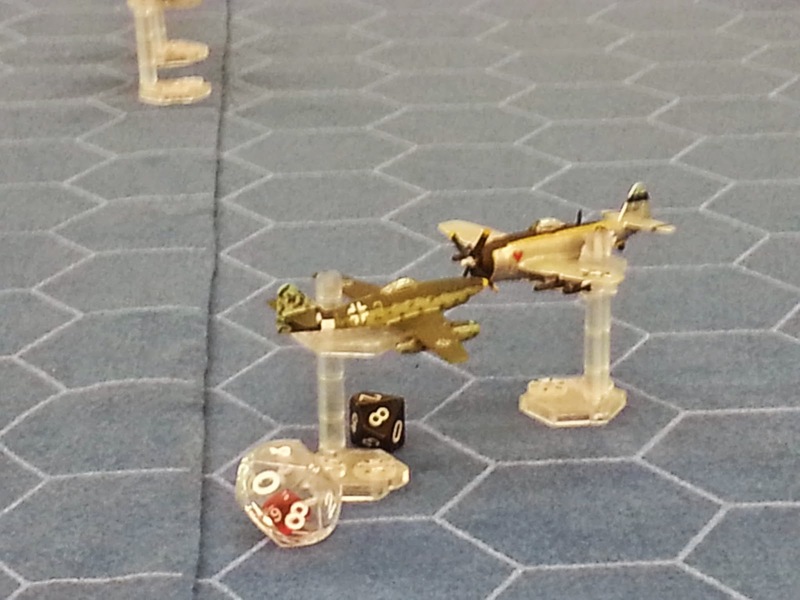 The FW Ta-283 jets across the board behind the protecting German planes and successfully makes it past the intercepting P51Ds, leaving Lt. Pritchard to salute his foe as the valuable prototype dives swiftly away to safety. 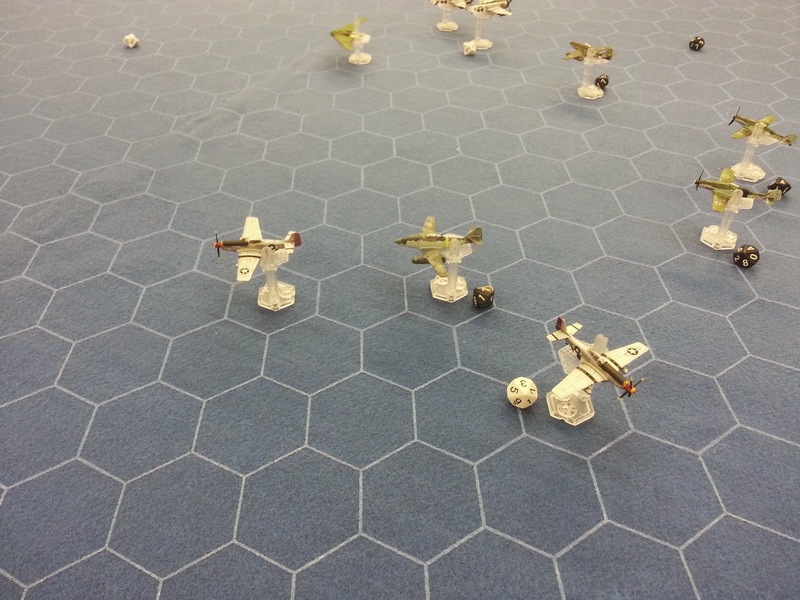 With both prototypes now beyond reach of the remaining American and German planes, and securing full victory points for each respective side, the confrontation now focuses on who can score the first kill. In effect, it's overtime and sudden death in the skies over Deutschland. After another turn maneuvering, Haptumann Baumal lines up an Me262 on one of Lt. Pritchard's P51Ds, but can't achieve the right angle of attack for a hit, loosing a string of cannon fire that had it hit, would surely have shredded the lighter plane to chaff. Simultaneously, Captain Ron finally achieves a point blank shot through a half loop, and blasts one of the FW190Ds out of the sky in flames. Realizing it is now or never, Hauptmann Baumal lines up for a deflection shot on a P51D with one of his Me262s, and scores hits, but not a kill. In doing so with a fast jet, he also ends up sending it off the edge of the map (with insufficient momentum to maneuver enough before exiting the map). "Mein Gott in Himmel, was zu tun!" With both sides having achieved major victory conditions (the safety of the respective prototypes), the battle is resolved as an Allied victory, with one FW190D shot down and one Me262 exiting off the map edge. One P51D is damaged, but able to reform with his colleagues, and the remaining planes are able to return to base. And as our plucky OSS agent said to Captain Ron and Lt. Pritchard upon exiting the Ho229 back at a base safely behind Allied lines, "One more step closer to VE Day!" Hauptmann Baumal, ever the gentleman, fires off a quick salute. "Bis zum nächsten Mal."